Im going to buy a set of cheap 4" 4ohm car speakers. Now to i just wire the + and - to the existing speaker? "The Sega amps are only 4 ohm capable. If you are using standard car audio 4 ohm speakers, these need to be wired in series. Do not just run the wires also over to the new speaker. If you do that you will be putting too much strain and heat on the audio amp and will blow it eventually if not soon. The proper way to wire these in series would be to desolder and move the - wire from the original speaker to the - on the new speaker. Then run a new wire from the - on the original to the + on the new speaker. Now everything is wired safely." So these two images which one is right? Neither of your images is correct. On first speaker you want in to + and then the out from - to + of second speaker and out from - of second speaker back to board. See image below. You can do what Medisinyl says too, but I actually prefer the series wiring. There's plenty of power to the backbox anyways, so increasing the ohms actually creates a more pleasant balance with the cabinet speaker with more bass. You could and should also find a high-sensitivity 4-ohm subwoofer for the cab and put a low-pass filter on it to complete the effect. I did it on my X Files and it sounds amazing. 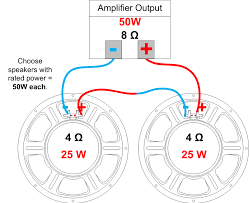 I'm saying that two 8-ohm speakers IS a 4-ohm speaker (in parallel), which would be optimal if you must use two speakers. Right i get what your saying now. Makes sense as i looked at my south park and it has 2 8ohms speakers wired in parallel. Just FYI, both of your images are parallel wiring, the second one you're just making the second speaker out-of-phase. Stern seems to do that or used to on some of their machines. Some say it is for a pseudo-surround effect, others say it's just a dumb mistake.